A built-to-suit project at FPT Bang Phli, in Samut Prakan, measures more than 37,000 square metres. SET-listed industrial estate developer Frasers Property (Thailand) Plc (FPT), formerly TICON, owned by the Sirivadhanabhakdi family, wants to utilise the vast land bank of the family’s TCC Group, some tens of thousands of rai in Chon Buri and Rayong, to expand its industrial estates and capitalise on interest in the Eastern Economic Corridor (EEC). President Sopon Racharaksa said TCC Group’s largest land bank in the eastern provinces boasts more than 10,000 rai, located near industrial estates in Chon Buri. In this province, FPT has 700-800 rai remaining for new industrial estate development. FPT also plans to spend 2 billion baht this year to transfer plots sized 2,000 rai to build a township development on Bang Na-Trat KM 22 in Bang Bo district, Samut Prakan. The township project will be developed by TRA Land Development Co, a joint venture between FPT, SET-listed industrial estate developer Rojana Industrial Park Plc, and Asia Industrial Estate Co, owned by the Sophonpanich family, with the trio holding stakes of 50%, 25% and 25%, respectively. Last October TRA won bids for plots totalling 4,315 rai on Bang Na-Trat KM 22 at a cost of 8.91 billion baht. About 2,000 rai was transferred to TRA early this year, with the rest being transferred by the end of this year. He said there is strong demand for industrial estates in the North, South and Northeast. In the North, FPT has 150 rai in Lamphun, five kilometres from the Northern Region Industrial Estate. The company has 200 rai on Mittraphap Road in Khon Kaen about 15km from Muang district, and 100 rai in Surat Thani about 20km from the airport. 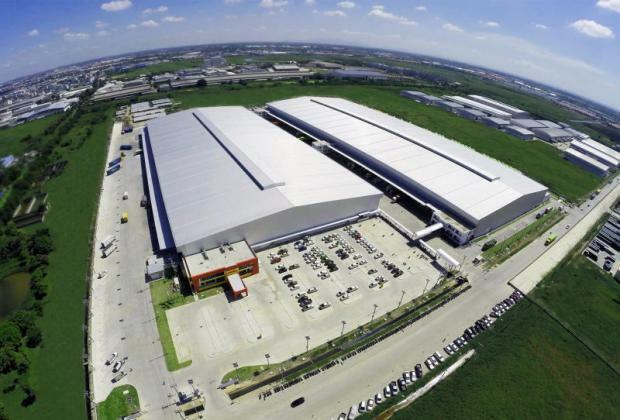 FPT manages 2.7 million square metres of factory and warehouse space in more than 50 locations nationwide, and has three major clusters of logistics parks in Ayutthaya’s Wang Noi district, Samut Prakan’s Bang Phli and the EEC area. Factory occupancy was 72% while that for warehouses was 80% in 2018. It targets having a total of 3 million sq m of factory and warehouse space in two years. Of the current 2.7 million sq m, more than 500,000 sq m is built-to-suit service spaces. It aims to add more than 120,000 sq m of built-to-suit space in the fiscal year ending Sept 30, 2019. FPT was renamed from Ticon Industrial Connection in February after Frasers Property Holdings (Thailand), owned by the Sirivadhanabhakdi family, became the major shareholder in 2017. FPT targets expanding industrial estate development in Ho Chi Minh City and Hanoi in Vietnam via Singaporean-based, Thai-owned Frasers Property Limited, similar to Berli Jucker. FPT shares closed on Tuesday on the SET at 17.30 baht, up 20 satang, in trade worth 545,590 baht.